Advocates In Action is an innovative self determination leadership academy designed to train individuals with disabilities; family members, siblings of family members with disabilities; or professionals working with people with disabilities. Advocates In Action provides state-of the-art knowledge about issues relating to developmental disabilities and builds the competencies necessary for Advocates in Action participants to become advocates who can effectively influence public policy. Seek a conference in order to network and expand knowledge of disability issues and attend if possible. Advocates In Action Leadership Academy will include two statewide events. The first session will be held in November, the second in January. Participants are required to make the commitment to attend all parts of both sessions. Participants will work toward achieving the goals set out in their personal MAP throughout the advocacy training period, with consultation from the project director. The Arc of Kentucky is actively seeking sixteen (16) highly motivated men and women to participate in Advocates In Action who want the best possible services for themselves or their families. 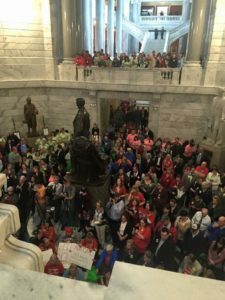 The Arc of Kentucky is particularly eager that the members of the group represent different ethnic backgrounds, different geographic regions, and a variety of disabilities. Reaching persons who are not actively involved in existing advocacy organizations is also a priority. Travel expenses for lodging, mileage, meals, respite care and support services for program participants will be reimbursed according to individual needs. Please feel free to share this information with interested individuals. Materials will be made available in alternative format upon request.